EOS is highly secure cloud-based software that works with your existing building systems to reduce energy costs in commercial buildings. 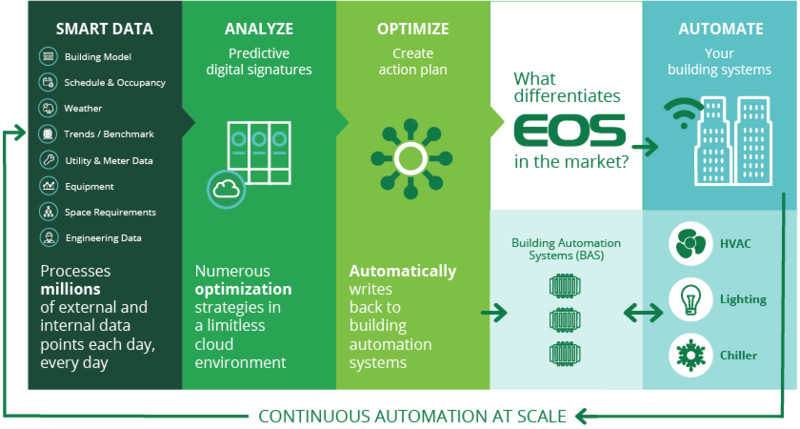 EOS works with your building systems (including Building Automation Systems) to gather minute-by-minute operational data and store it in the cloud. EOS analyzes that data, in addition to weather, time of day pricing of electricity, occupancy and event schedules, and uses adaptive machine learning to determine how to maximize everyone’s comfort while saving the most money. Then, it automatically updates set points in your building systems. Your energy costs are reduced without giving anything up. Other building optimizations systems don’t monitor and optimize as many parameters as EOS does. We help simplify your day-to-day operations while your energy savings add up without the intervention of your operations team. EOS is unique because it automatically generates energy savings in your commercial building. Unlike Building Automation Systems (BASs), which are only designed to meet defined safety, comfort and air quality parameters, EOS considers the energy cost required to achieve your goals. EOS’s dynamic optimization engine works directly with your building systems, constantly monitoring performance and simplifying day-to-day operations. EOS stores, manages and analyzes the data required to improve efficiency, optimizing set points and significantly increasing the capabilities of your operations team. In a medium-sized building, EOS makes over 2,000 adjustments every day to give you the most comfort and the best energy performance possible. Equipment run times, start-stop times and soft-starts. Occupancy cues and your existing scheduling systems. The thermal storage of your building structure and equipment. The interrelated impacts of one building system on another. EOS doesn’t make changes to your existing building controls or equipment. With the press of a button, EOS can be disabled and the native control systems continue to function as they did before.